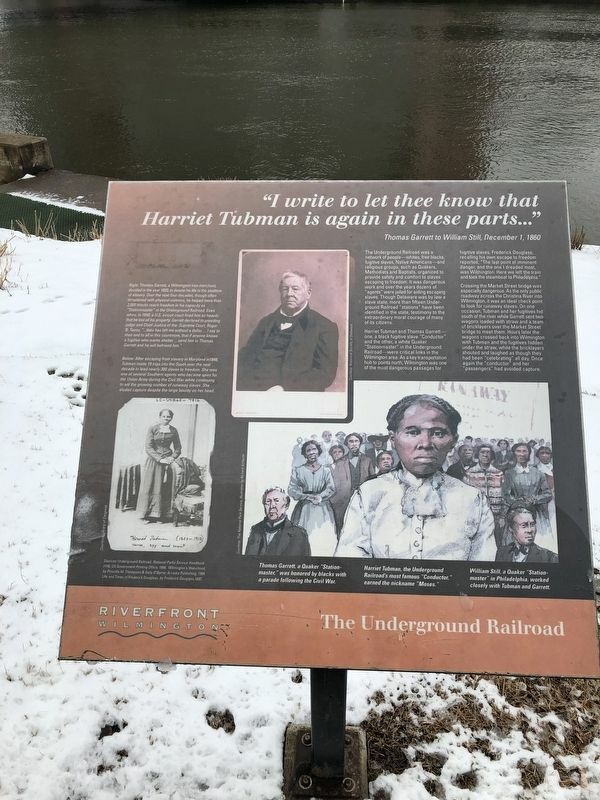 "I write to let thee know that Harriet Tubman is again in these parts..."
The Underground Railroad was a network of people—whites, free blacks, fugitive slaves, Native Americans—and religious groups, such as the Quakers, Methodists and Baptists, organized to provide safety and comfort to slaves escaping to freedom. It was dangerous work and over the years dozens of "agents" were jailed for aiding escaping slaves. Though Delaware was by law a slave state, more than fifteen Underground Railroad "stations" have been identified in the state, testimony to the extraordinary moral courage of many of its citizens. was Wilmington. Here we left the train and took the steamboat to Philadelphia." Crossing the Market Street bridge was especially dangerous. As the only public roadway across the Christina River into Wilmington, it was an ideal check point to look for runaway slaves. 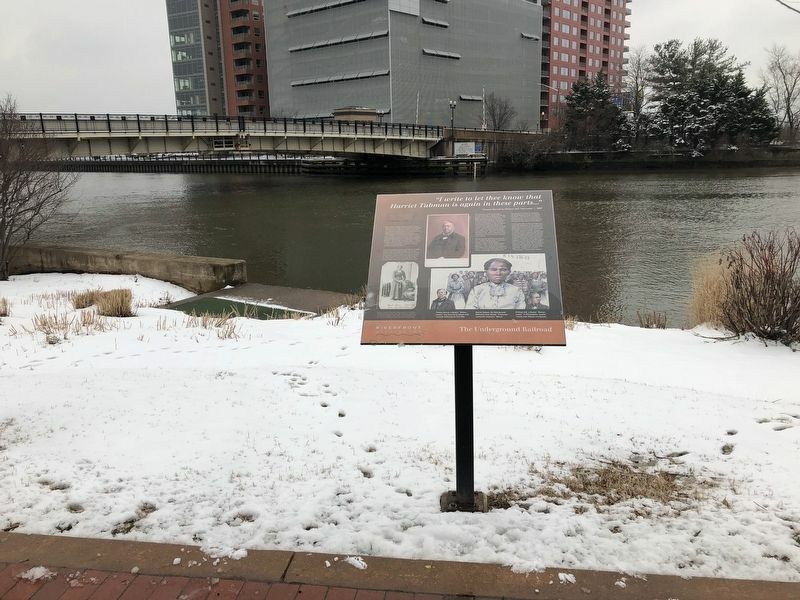 On one occasion, Tubman and her fugitives hid south of the river while Garrett sent two wagons loaded with straw and a team of bricklayers over the Market Street bridge to meet them. Hours later the wagons crossed back into Wilmington with Tubman and the fugitives hidden under the straw, while the bricklayers shouted and laughed as though they had been "celebrating" all day. Once again the "conductor" and her "passengers" had avoided capture. Right: Thomas Garrett, a Wilmington iron merchant, decided in the year 1820, to devote his life to the abolition of slavery. Over the next four decades, though often threatened with physical violence, he helped more than 2,000 blacks reach freedom in his capacity as "Stationmaster" in the Underground Railroad. Even when, in 1848, a U.S. circuit court fined him so heavily that he lost all his property, Garrett declared to presiding judge and Chief Justice of the Supreme Court, Roger B. Taney, "...thou has left me without a dollar ... I say to thee and to all in this courtroom, that if anyone knows a fugitive who wants shelter ... send him to Thomas Garrett and he will befriend him." Below: After escaping from slavery in Maryland in 1848, Tubman made 19 trips into the South over the next decade to lead nearly 300 slaves to freedom. She was one of several Southern agents who became spies for the Union army during the Civil War while continuing to aid the growing number of runaway slaves. She eluded capture despite the large bounty on her head. Thomas Garrett, a Quaker "Stationmaster," was honored by blacks with a parade following the Civil War. Harriett Tubman, the Underground Railroad's most famous "Conductor," earned the nickname "Moses." William Still, a Quaker "Stationmaster" in Philadelphia, worked clossely with Tubman and Garrett. Location. 39° 44.217′ N, 75° 33.274′ W. Marker is in Wilmington, Delaware, in New Castle County. Marker is on South Market Street (Business U.S. 13) south of South Shipley Street, on the right. Touch for map. Marker is at or near this postal address: 101 South Market Street, Wilmington DE 19801, United States of America. Touch for directions. Other nearby markers. At least 8 other markers are within walking distance of this marker. South Market Street Bridge (here, next to this marker); South Market Street Bridge Dedicated in Honor of Senator John E. Reilly, Sr. (within shouting distance of this marker); Freedom Lost (within shouting distance of this marker); The Great Railroad Boom (about 300 feet away, measured in a direct line); Harriet Tubman (about 500 feet away); The Big Quarterly (about 500 feet away); a different marker also named The Great Railroad Boom (about 500 feet away); a different marker also named The Great Railroad Boom (about 800 feet away). Touch for a list and map of all markers in Wilmington. More. Search the internet for The Underground Railroad. Credits. This page was last revised on March 4, 2019. This page originally submitted on March 2, 2019, by Devry Becker Jones of Washington, District of Columbia. This page has been viewed 40 times since then. Photos: 1, 2. submitted on March 2, 2019, by Devry Becker Jones of Washington, District of Columbia. • Bill Pfingsten was the editor who published this page.